Entering the Windows telnet.exe prompt mode causes the shell process underneath Console2 to crash on Windows 7. You can reproduce this by just invoking telnet with no arguments in a Console2 session. An alternate route to hit this is exiting a telnet session with CTRL+]. 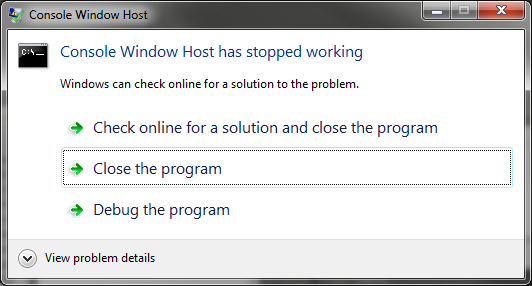 The symptom is Console2 freezing because it is no longer getting text from its slaved native console followed up with a crash dialog for conhost.exe and whetever your shell was. A workaround is to launch telnet into a separate conhost.exe window. #force telnet.exe to start in its own console window. Unless you need something nifty that telnet.exe is doing, a more elegant solution is to Lee Holmes’ Connect-Computer.ps1 PowerShell script as a telnet replacement.